I have planned enough book-inspired activities for my children to know if they are going to enjoy it. There have been many times that my initial activity idea has made me feel uneasy. On those occasions, I have always opted to rethink my plans. Most of the time, when the perfect idea just isn't there, I pay closer attention to my children when I read them the books by the author or illustrator we are celebrating. I listen to their questions about the text. I think about their comments about the illustrations. I observe the parts of the book they get excited about. When I do this, my feelings are confirmed that I need to abandon the first idea because they have given me a better one. However, that is NOT exactly what occurred this week. What occurred this week was something that I don't think has happened in the four years we have been working on this blog. I had an awesome idea for birthday celebration activity. I had even taken preliminary photographs of the materials we were going to use to bring the book to life. Then, I read more books by Ashley Wolff, specifically the Miss Bindergarten books written by Joseph Slate. 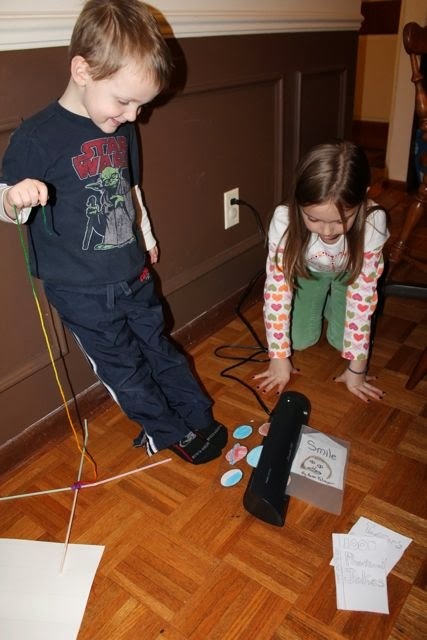 The next thing I knew my children had come up with a completely different activity that turned out better than what I had in mind. Ashley Wolff has illustrated over 50 books for children including the Miss Bindergarten series written by Joseph Slate, Baby Bear Sees Blue, and Old MacDonald Had a Wood Shop by Lisa Shulman (This was the book that I was going to feature this week, but my children had other ideas! No worries. I will just file it away for another time!) Her first book, A Year of Birds, was published in 1984 after her editor, Donna Brooks, fell in love with a "linoleum block print of a girl in a red coat, kneeling in the snow, feeding the birds" and asked her to create a whole story about the girl (Eastbay Express). Ashley did just that and her first book became an ALA Notable Book. A Year of Birds "opened the publishing door" to Ashley and she wrote and/or illustrated about a dozen more books before landing the job as the illustrator for the Miss Bindergarten series. (Seven Impossible Things). The first book in the series, Miss Bindergarten Gets Ready for Kindergarten was published in 1996 and the series is still going strong with the recent release last fall 2013 of Miss Bindergarten and the Secret Bag. 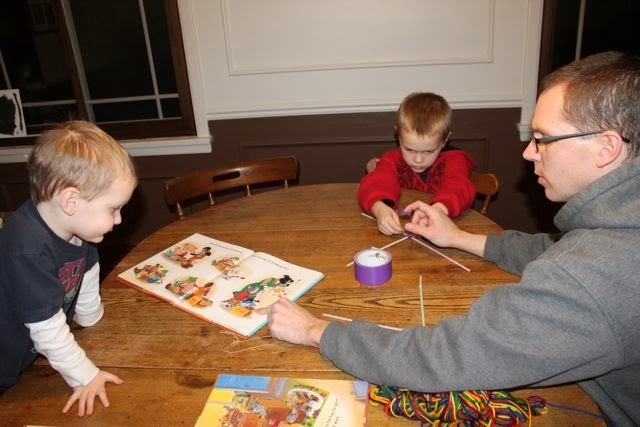 I read numerous books to my children by Ashley Wolff including Baby Bear Counts One, When Lucy Goes Out Walking, and Old MacDonald Had a Woodshop. Then, my boys discovered Miss Bindergarten Has a Wild Day in Kindergarten and Miss Bindergarten Celebrates the Last Day of Kindergarten. I learned while reading an article from Wood County District Library that Joseph Slate envisioned Miss Bindergarten and her children as human beings. Ashley Wolff said, "It was my idea to transform everyone into an animal. It appealed to me that Adam could be a little boy whose name began with A and be an alligator." 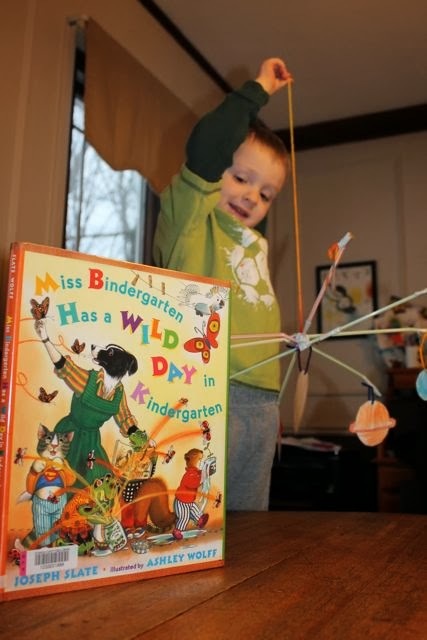 My children loved learning the names of each of Miss Bindergarten's students -- their favorite was Christopher the cat. My youngest son, pictured below in the Star Wars t-shirt, took notice of illustrations of mobiles in both books. In Wild Day, there is a mobile of sea animals and in Last Day there is a mobile of the solar system. We paused and talked about mobiles. 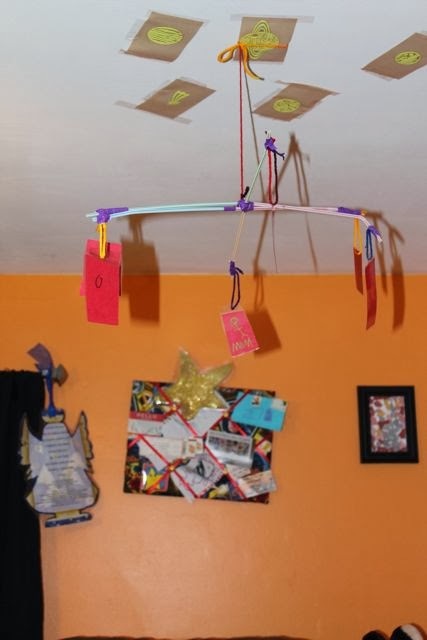 (I thought to myself, "Wow, it would be fun to make mobiles, but I already have an idea for our birthday celebration activity.) We talked about the mobiles each of them had on their cribs when they were babies too. That night, I found a bag of drinking straws that I thought we could use if we were going to make mobiles. But, I didn't even take them out of the drawer, because they would only distract me from the other project I had planned. The next night, while I was cleaning the kitchen after dinner I saw those straws again and started playing around to see if a mobile could be made out of them. I wasn't five minutes into thinking about this possibility when my oldest son said, "Whatcha doin' Dad?" 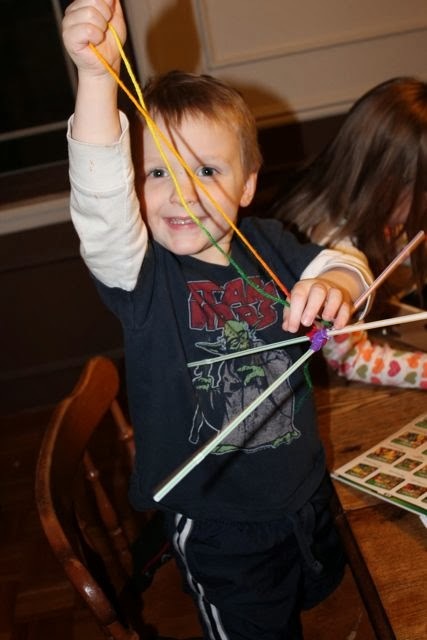 I told him, "I am trying to figure out if there is a way to make a mobile out of all these straws." He responded, "Like from Miss Bindergarten. I want to make one." I said, "Well, sure. But, I really don't know how to make one." At this moment, without warning, the birthday celebration for Ashley Wolff was on! It wasn't long before my other son came into the dining room. We looked at the illustrations of the mobiles once again. 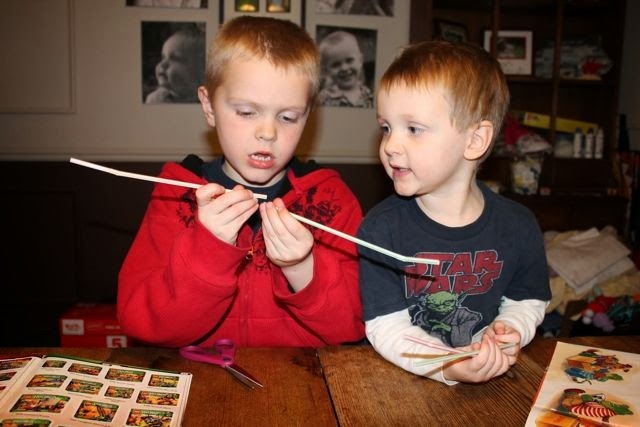 He showed his brother how to cut slits in the end of the straw so that you could fit one inside the other to make the straw longer. The whole family was in on the action now. Ideas were flying on how to make the mobiles. 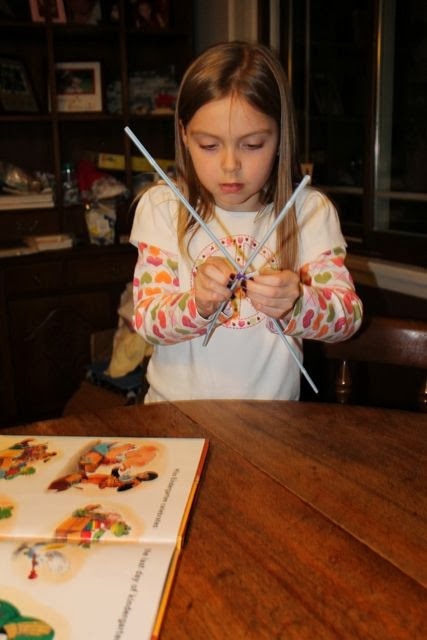 Duct tape and yarn were used along with the straws. Once the mobile structure was made, they quickly moved onto the theme for their mobile. 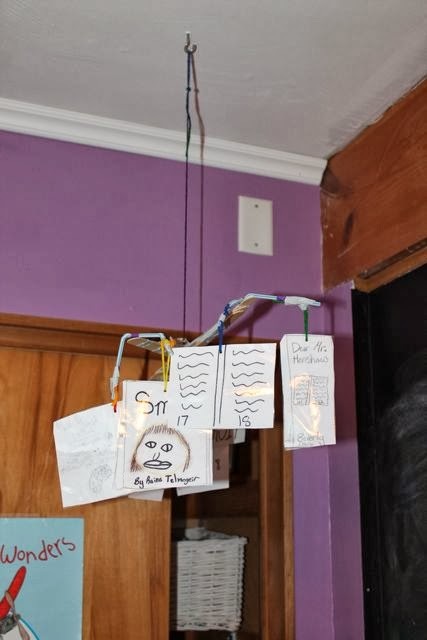 My daughter chose to make a mobile of her favorite books. 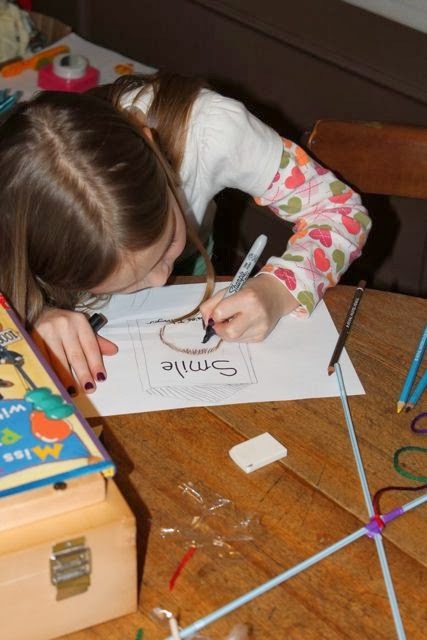 Here she draws the cover of a book that she has read dozens of times, Smile by Raina Telgemeier. 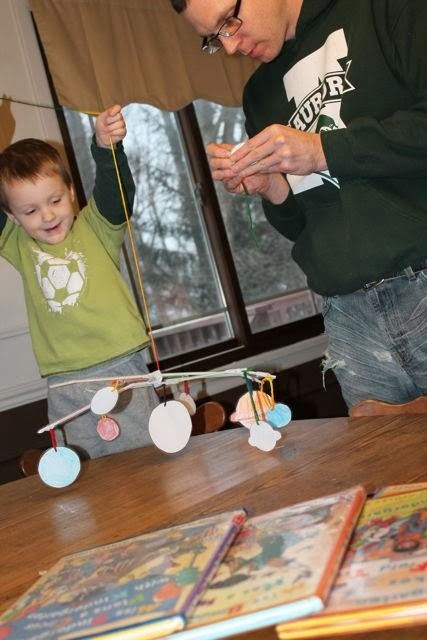 My youngest son wanted to make a solar system mobile just like the book. I made the shapes for the planets, per his direction, and he colored them based on Ashley Wolff's illustration. We chose to laminate their drawings with our new laminator! 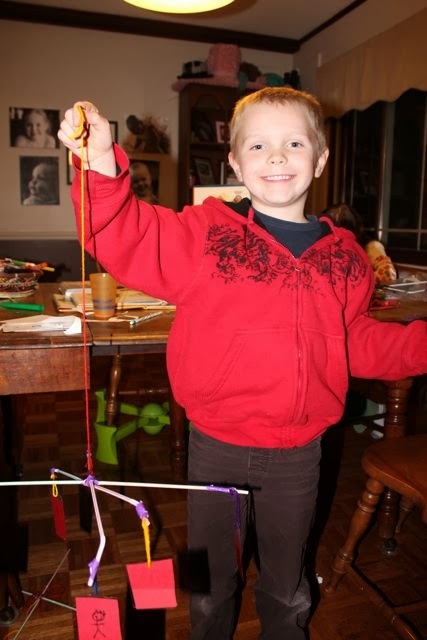 My son made a mobile of all the people in his family. Then, he discovered a place to hang it above his bed. I thought this was a cool idea -- his family is right their with him even when he is sleeping. I surprised my daughter and hung her mobile in her room was she was at school the next day. She added many things to her mobile which required the straws to be reinforced with tongue depressors. 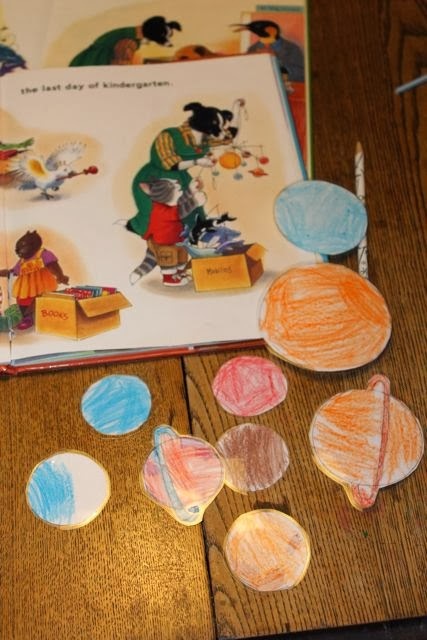 My son and I worked together to attach his planets to his mobile. A big thanks to my children for coming up with a great project! 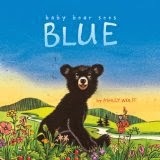 Baby Bear Sees Blue Book Trailer from ashley wolff on Vimeo.